Howard Constantine has unveiled a new Nixie Clock Kit he has created that is now available to back from $115 via Kickstarter and provides a unique row of nixie tubes that have been backlit by RGB LEDS to provide a more aesthetic and original finish. The clear case of the clock allows you to see all the mechanical elements that have been constructed to create the timepiece which can be mounted either on the wall or on a desktop depending on your preference. The Nixie Clock Kit combines two integrated circuits or “chips”, one in the form of the 18f26k20 micro-controller which is programmed with myHoward’s original firmware and the other is a high voltage decoder similar to a 74141. Watch the video below to learn more about the Nixie Clock Kit’s construction and design. This is our Nixie clock version using the really economical IN12A/IN12B nixie tubes, and designed to be built as a wall clock or table clock. We have created a prototype with both boards professionally made and are also developing a kit for DIY. We designed the IN12 nixie clock to be aesthetically pleasing and sturdily built as well as long lasting. One of the features that sets it apart from other nixie clocks is the unique homemade enclosure. I fashion these out of plexiglass stock and thermoform them to create the unique look. The pictures display the design for a 1/8″ plexiglass enclosure, formed from a single piece of plexiglass. The ends are open on this design.The nixie tubes are completely visible from three sides and so are the neon bulbs used as colons. Another unique feature is the circuitry design: it is built using entirely replaceable/repairable parts. The components are all standard sized and selected to be large enough to easily handle the wattage generated. Also, the two layer design gives the clock a more solid form than other designs. The power supply is integrated in the back layer pc board, and can be built either as a standard supply with the transformer mounted on the board, requiring only a standard electric cord, or using a power supply cord with transformer and a switching power supply. The latter design makes the clock much lighter and is more suitable for wall mounting. The input can be set for 120VAC (U.S. standard) or for 240VAC (some countries) by simply setting a small jumper on the back board (please see picture) when using the integrated transformer design. Battery backup is optional using a nine volt battery. The front layer board contains the micro controller running my original firmware and decoder as well as digit driver circuitry and the nixie tubes. 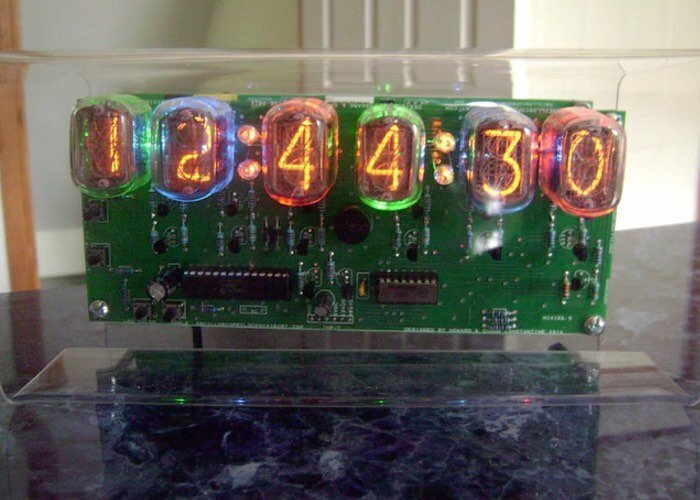 Altogether, this makes the IN12 Nixie clock very unique and attractive, as well as durable and easy to maintain. For more information on the new Nixie Clock Kit jump over to the Kickstarter website for details by following the link below.